Bring a large pot of water to a boil. This will be to cook the pierogi once they are ready. Begin by pouring 2-3 Tbsps of oil and 2 diced onions into a frying pan. Stir together and fry over a low flame to caramelize the onions. Cook for about 10-15 minutes. For the pierogi dough, you will need a flat and clean surface to work on. Begin by pouring the flour onto the surface and clear a space in the center of the flour. To the center, add a pinch of salt, 1 Tbsp. of olive oil, the 3 eggs and a splash of water. Begin working the flour from the outside into the center to mix well using your hands. If still dry, slowly add small amounts of water to mix the dough. Continue kneading to mix the dough well. Once the dough is ready, place into a bowl and cover with a damp cloth to keep it from drying out. In a separate bowl, mix the mashed potatoes, caramelized onions, a pinch of salt, and farmer cheese for the pierogi filling. Cut a piece of the dough off and place onto the flat surface. Place the rest of the dough make into the bowl covered with the damp cloth. Roll out the small piece of dough using a rolling pin. Once flattened out, use a cup to cut out circular pieces of the pierogi. Now, place a tsp. of the pierogi filling onto the center of one of the circular dough pieces. 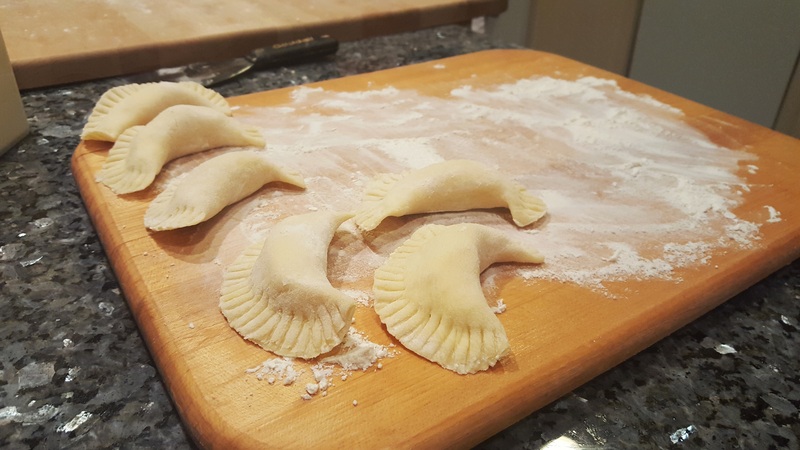 Fold the dough onto itself and press the edges to seal the pierogi shut. You can also use a fork to press into the edges to make a design. 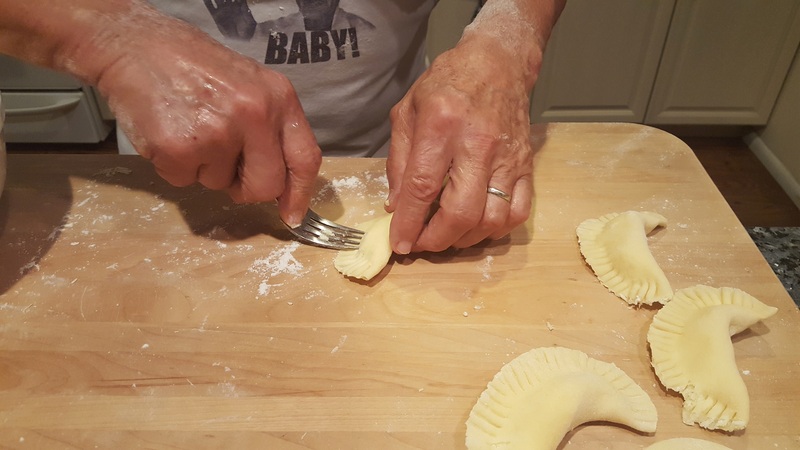 Continue this step to make the rest of the pierogi. You can freeze the pierogi that you are not ready to cook yet. Add the amount of pierogi you would like to eat into the boiling pot of water and cook for about 4 minutes or until the pierogi are floating at the top. Remove from the water and set aside. In a frying pan, fry the bacon and 1/2 diced onion. 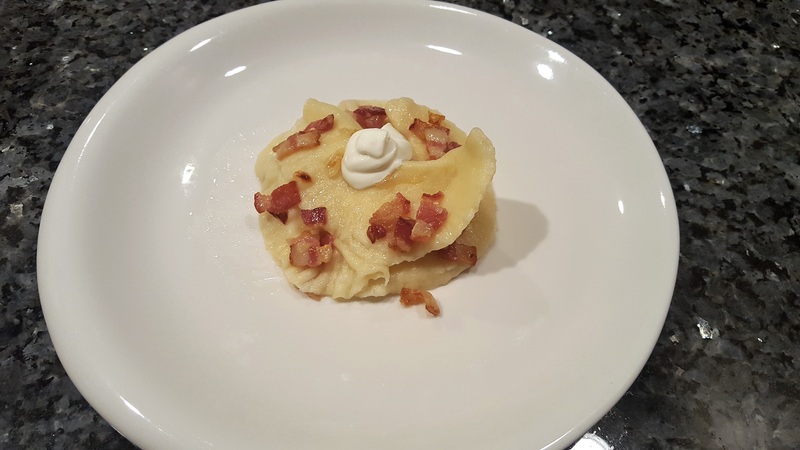 Once the bacon is cooked, add the pierogi and mix together. Set on a dish and serve with a side of sour cream to dip into. Enjoy and cin cin!